CAPITALISM FIXES PROBLEMS AND PRESERVES DEMOCRACY: Capitalism is what we should be relying on to fix our problems. Capitalism has it’s own ecosystem, just like biology’s ecosystem. An economic ecosystem that weeds out the weak, has parasites that eat the failures and new bacteria that evolves and grows replacements for that which failed. A system that keeps everything in balance. The problem is we are no longer a capitalistic society. What we were taught in school is now utter and absolute nonsense. Capitalism is a thing of the past. As outlined in “It’s Not A Financial Crisis – It’s A Stupidity Crisis”, we created two back to back bubbles. The air out of the Tech Bubble was sucked up for fuel by our next stupidity crisis: The Housing Bubble. Now, after the second Stupidity Crisis there isn’t a third bubble to inflate. If we still lived in a capitalistic environment the banks and financial institutions that created loans for folks who should have remained renters and then sold those loans as investments to pensions and countries would have been cleansed by capitalism’s ecosystem. But that isn’t what happened. In a very anti-capitalistic move the government decided that stupidity and criminal activity should be rewarded. I’d say they took our money, but it is worse, we didn’t have that much money. So they borrowed the money in our name. The loan has a variable rate. They borrowed so much money that our kids cosigned the loan. In fact, our kid’s future kid’s signed on the dotted line. That is unequivocally immoral. They gave that borrowed money to a bunch of morons as a reward for stupidity. Morons who created subprime loans, liar loans, no income, no documentation loans and other fraudulent instruments. Morons bundled that trash, got it rated AAA and then sold these turds or weapons of mass destruction that they had the audacity to name complex financial instruments or derivatives to pension funds, countries and other “investors”. Then it all blew up. Big surprise. For blowing up the world’s economy this Stupidity Crisis was falsely named an Economic Crisis by CNBS and 535 morons on a hill in DC (Ron Paul and a few other fiscally responsible adults excluded). The idiots who created the mess were rewarded with a 700 billion dollar “bailout”. This “bailout” was anything but a bailout and had a price tag of anything but 700 billion. The actual price tag is closer to 11 trillion and puts us on the hook for another 13-17 trillion – not counting interest. Think about that for a second. This stupidity crisis is the equivalent of our Federal Debt which took a generations of politicians over a hundred years to wrack-up. For anyone who still believes we live in a free country where capitalism reigns please show me one economic textbook which states that failure, and fraud get rewarded with borrowed taxpayer money. 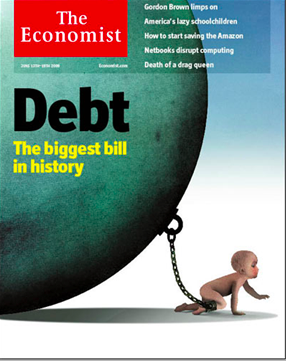 For anyone who believes we live in a democracy please show me a textbook that says the government will en-debt you and your kids and their kids to pay for a failed business. How is that democratic? “Law of Morons”: Years ago, while serving on a committee I came to a sad realization. Like gravity, there is the another invisible force which I dubbed “The Law of Morons”. Put a group of very intelligent, well meaning people in a room together, put them on a committee or some governmental body that is devoid of guiding principles or merit-based decision making and “The Law of Morons” will prevail. The collective IQ will drop to the smallest shoe size in the room. And hope for loafers, because collectively this body won’t be able to tie anything together – not even a single shoelace. Government Creates Problems: Basically our government is comprised of many well meaning intelligent people who for whatever reason, re-election, greed the “Law of Morons”, corporate puppet strings (read: lobbyist), self interest, corporatocracy or whatever else, do nothing but create massive problems. Lack of regulation, too much regulation. Posted in American disintegration, Banking as control system, Corporatocracy, Future world? I STILL THINK THE MOST LIKELY SCENARIO IS THAT SOME AGREEMENT TO AGREE IS MADE AT THE SUMMIT, which is then followed up by increased printing from the ECB, coupled with new Fed policies and fresh IMF money. Although that still seems the most likely, I am getting concerned that Europe is once again missing the point. Many EU leaders seem to actually believe that the Treaty changes are important. The reality is the market could care less about treaty changes. The market cares about only one thing, that the ECB will announce new, bigger, more aggressive sovereign purchases. That’s all the market cares about. The market believes that the treaty changes provide an excuse for the ECB and IMF to ramp up their efforts. The EU can do all the treaty changes it wants, but if it is not followed up with aggressive new printing policies, the markets will sell-off. Not only are politicians acting as though the treaty changes mean much, there is even talk about being able to implement changes without national votes. That idea horrifies me on a personal level as it is yet again trashing any sense of democracy, but it is bad for the markets. I have been assuming that the meeting will result in another agreement to agree. That is relatively easy to pull together. Since it doesn’t really mean much, any countries that aren’t really on board, can be cajoled into holding hands for the photo op and pretending they agree long enough for the ECB and IMF to throw more money at the problem. Agreement is far less likely if real permanent changes are being implemented. It is one thing to agree to the plan on the condition that you have to go back and get approval. It is much more risky for someone to agree to permanent changes implemented using some backdoor legal technique. Talk of actually implementing policy action this week is actually a negative as it makes it less likely that they can announce a “successful” summit. On a side note, my favorite part of the proposal is the fines for going over the approved limits. So countries that have the biggest deficits will be fined, adding to those deficits? Debtor’s prison never worked very well, so why this would accomplish much is beyond me and would likely be waived any time it could be used. But no one on Wall Street has bothered to read the treaty proposals because no one cares, all anyone cares about is that the ECB uses it as an excuse to print. Yesterday’s FT rumor of ESM and EFSF working together was yet another reason to be afraid that Europe doesn’t get it. Not only would implementing both at the same time place the AAA rated countries at greater risk of downgrade, it ignores the fact that EFSF has been a total failure. I thought Europe had moved beyond floating yet another iteration of something that hasn’t worked. The fact that they haven’t is a potential indication that the printing presses aren’t going to be turned on as soon as the market would like. Finally, there is more and more talk about what the national central banks can do. People are acting as though they were cleaning the living room, and found some money when they lifted up the cushions on the couch. This is not “found” money. Participants and lenders are well aware of these reserves. They can be used for example to fund loans to the IMF to lend back to some countries, though I don’t fully understand why they can’t just lend to the countries directly, but I assume there is some law that lending to the IMF lets them circumvent. But there will be a cost to these actions. There will be a consequence, and although it will later be viewed as “unintended” the consequences are actually foreseeable. The countries with large reserves at the national central bank level have a reduced cost of funds because of those reserves. Lenders are not always totally stupid. There is value that is being realized from having those reserves. Using them to create loans for the IMF will impact that country’s ability to borrow. Plain and simple. The fact that many pundits are treating this as newfound money that can be used any which way, without consequences is absurd and is yet another example of why so many ideas have failed. Any plan that raids the national central banks for money for the PIIGS needs to be thought through more carefully and the potential costs need to be addressed. The cost/benefit analysis may be worth the risk, but I suspect serious analysis would show that it is a bad idea. The cost/benefit should be about zero since it is just shifting money from one place to another. There really is no obvious reason to believe that this is a net positive. In the real world it is likely negative because as we have seen time and again, these changes break the existing model and that causes confusion which more than offsets any potential benefit (not triggering CDS is a shining example). So while we limp along towards the most likely outcome, the risk of disappointment or even outright failure continues to grow. The inability to hold yesterday’s rumor rally is a signal that the market has moved well past the short squeeze phase and is now trading long. IT’S REALLY SOMETHING TO LIVE IN A COUNTRY THAT DOESN’T KNOW what it is doing in a world that doesn’t know where it is going in a time when anything can happen. I hope you can get comfortable with uncertainty. If there’s one vibe emanating from this shadowy zeitgeist it’s a sense of the total exhaustion of culture, in particular the way the world does business. Everything looks tired, played out, and most of all false. Governments can’t really pay for what they do. Banks have no real money. Many households surely have no money. The human construct of money itself has become a shape-shifting phantom. Will it vanish into the vortex of unpaid debt until nobody has any? Or will there be plenty of worthless money that people can spend into futility? Either way they will be broke. The looming fear whose name political leaders dare not speak is global depression, but that is not what we’re in for. The term suggests a temporary sidetrack from the smooth operation of integrated advanced economies. We’re heading into something quite different, a permanent departure from the standard conception of economic progress, the one in which there is always sure to be more comfort and convenience for everybody, the economy of automatic goodies. A big part of the automatic economy was the idea of a “job.” In its journey to the present moment, the idea became crusted with barnacles of illusion, especially that a “job” was a sort of commodity “produced” by large corporate enterprises or governments and rationally distributed like any other commodity; that it came with a goodie bag filled with guaranteed pensions, medical care to remediate bad living habits, vacations to places of programmed entertainment, a warm, well-lighted dwelling, and a big steel machine to travel around in. Now we witness with helpless despair as these illusions dissolve. The situation at hand is not a “depression,” though it may resemble the experience of the 1930s in the early going. It’s the permanent re-set and reorganization of everyday life amidst a desperate scramble for resources. It will go on and on until there are far fewer people competing for things while the ones who endure construct new systems for daily living based on fewer resources used differently. In North America I believe this re-set will involve the re-establishment of an economy centered on agriculture, with a lot of other activities supporting it, all done on a fine-grained local and regional scale. It must be impossible for many of us to imagine such an outcome – hence the futility of our current politics, with its hollow promises, its laughable battles over sexual behavior, its pitiful religious boasting, its empty statistical blather, all in the service of wishing the disintegrating past back into existence. This desperation may be why our recently-acquired traditions seem especially automatic this holiday season. Of course the “consumers” line up outside the big box stores the day after the automatic Thanksgiving exercise in gluttony. That is what they’re supposed to do this time of year. That is what has been on the cable TV news shows in recent years: see the crowds cheerfully huddled in their sleeping bags outside the Wal Mart… see them trample each other in the moment the doors open! The biggest news story of a weekend stuporous from leftover turkey and ceremonial football was a $6.6 billion increase in “Black Friday” chain-store sales. All the attention to the numbers was a form of primitive augury to reassure superstitious economists – more than the catatonic public – that the automatic cargo cult would be operating normally at this crucial testing time. The larger objective is to get through the ordeal of Christmas. I don’t see how Europe gets through it financially. The jig is up there. Lovely as Europe has become since the debacles of the last century – all those adorable cities with their treasures of deliberately-created beauty – the system running it all is bankrupt. Europe is on financial death-watch and when the money stops flowing between its major organs, the banks, the whole region must either go dark or combust. Nobody really knows what will happen there, except they know that something will happen – and whatever it is portends disruption and loss for the worlds largest collective economy. The historical record is not reassuring. This holiday season spend a little time musing on what the re-set economy will be like in your part of the country. Think of what you do in it as a “role,” or a “vocation,” or a “trade,” or a “calling,” or a “way of life,” rather than a “job.” Imagine that life will surely go on, even civilized life, though it will be organized differently. Add to this the notion that you are part of a larger group, a society, and that societies evolve emergently according to the circumstances that their time and place presents. Let that imagining be your new American Dream.